4.0 out of 5 based on 23 bloggers and 6 commenters. 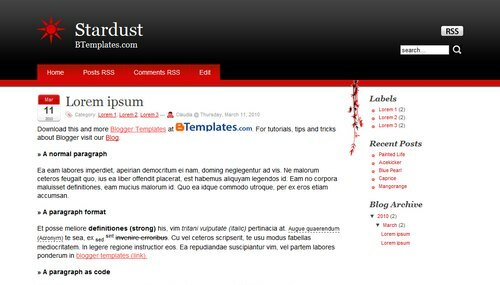 Stardust is a free blogger template adapted from WordPress with 2 columns, responsive design, right sidebar and floral motifs. I cannot see the Top Menu Bar. I confirm I have put 2 links, but they didn’t aper. Thank you for your answer. But I have already put 2 Links but you can’t see them. I open my DraftBlog (talinbrezmes2.blogspot.com/), so you can check it yourselves. @Minibiti: Go to Settings/Formatting and change the timestamp format (not the date header) to “Monday, November 8, 2010”. I´ve tried “Go to Settings/Formatting and change the timestamp format (not the date header) to “Monday, November 8, 2010″. I still get an undefined date.. any idea?